Bourne Cricket Club's Jaidka Cup winning team last year. The area’s most prestigious Twenty/20 Cup competition has undergone another makeover. The Jaidka Cup 2015 will, for the first time in its 80-year history, no longer be a straight knockout event. The Jaidka Committee, which in recent years has introduced coloured clothing, team nicknames and scrapped the two-innings final, has introduced a ‘zonal group’ system in order to cut down on long distance travel for a midweek game and to ensure teams get to play at least two matches. Twelve teams have entered a competition won by the splendidly-named Royal Challengers Bournegalore last year. They beat March Crows in the final. There’s a welcome return for the Ramsey Raiders and a first appearance for decades for Spalding. Khalsa, Yaxley and Ufford Park are not competing in the 2015 competition after taking part in 2014. Holders Bourne have a tough group with Spalding and Market Deeping. Only one team from each group will advance to the semi-finals. In the event of a tie in the group stages run-rate will determine the winners. 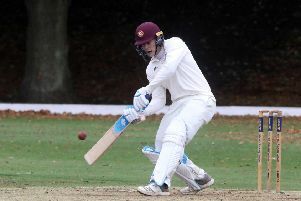 March Crows, who returned to Jaidka action for the first time in 10 years last season and promptly toppled National Twenty/20 finalists Peterborough Town and holders Wisbech, are also in a tough group alongside fellow Cambs Division One sides Wisbech and Ramsey. Draw: Zone A - Ketton Lions, Burghley Park Bears, Barnack. Zone B - Royal Challengers Bournegalore, Market Deeping Dragons, Spalding. Zone C - Nassington Knights, Castor Harlequins, Peterborough Town Newflames. Zone D - Wisbech Wildcats, March Crows, Ramsey Raiders. Zonal matches will take place on Wednesdays, May w13, 20 & June 3. The semi-finals are scheduled for June 10 and June 17 with the final to take place on June 24. Champions Bourne open their defence at home to Spalding.